From day one, I've wanted to print from my iPad and iPhone as easily as I can from my Mac. And for those who have an ePrint enabled HP printer, that day is here. I've been testing an HP LaserJet Pro 100 M175NW Laser printer that has ePrint services as part of its wireless feature set. I can now easily print from my iOS devices, plus I'm enjoying a few bonus web services that I didn't expect. 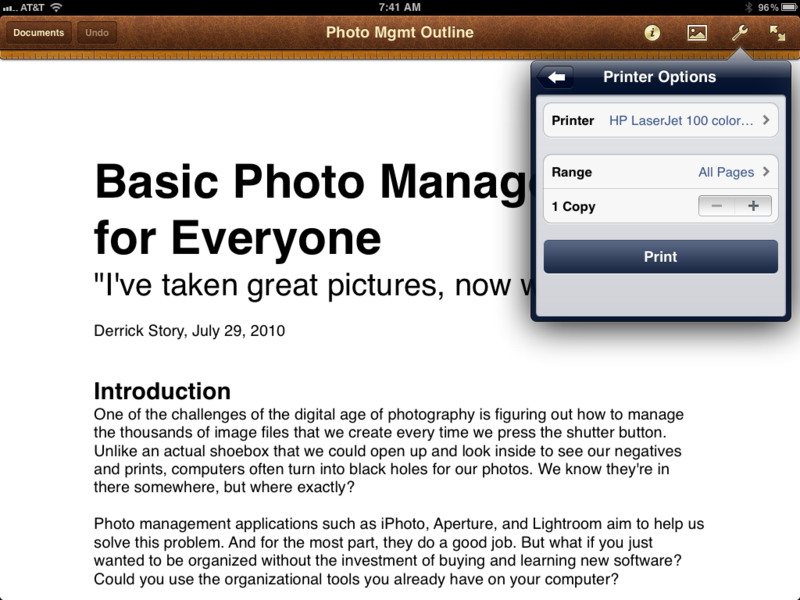 When I go to print in Pages on my iPad, the HP LaserJet Pro shows up in the dialog box. To get started, you have to go through the usual set-up process for the HP printer to get it on your WiFi network. I ran into one glitch with the LaserJet 100 because its bundled software disc wasn't compatible with Mac OS X 10.7 Lion. Since a Lion update wasn't available yet, I had to connect the printer to a Snow Leopard Mac. Once the set up was complete, I've had no problems printing, checking supply levels, etc. from any of my Macs running Lion or Snow Leopard. The hiccup is having to physically connect the printer to the computer via an USB cable to run the set-up software. If I had been able to connect the printer to the network wirelessly without involving my computer, I wouldn't have had any problems. Hopefully HP will release downloadable Lion-compatible software soon to ease this problem. Once the printer is on the network and the Internet, I could go to www.eprintcenter.com and register the HP LaserJet using its unique code (that it will print out for you). As part of the registration process, you establish an unique email address for the printer. Now the fun begins. I can print photos and documents directly from my iOS devices because the LaserJet shows up in all of their print options dialogs. It's literally as easy as printing from my Mac. Since I'm printing on plain paper with toner instead of ink, it's more affordable than inkjet output. Documents are crisp and detailed. Photos look remarkably good. I'm very happy with the HP LaserJet output. But there's more. You can really get your geek on by taking advantage of HP's web services. When you establish your ePrint account with them, and choose your unique email address for the printer, you can use that email address to print from anywhere. I've been testing it with attachments I've received via Gmail and the Mail app for my iOS devices. All I have to do is forward that email to the printer address, and the LaserJet will output both the email and the attachment. HP supports a variety of file types: Microsoft Word, PowerPoint, Excel, Text files (.txt), PDF, HTML, and images (bmp, jpg, png, gif, tiff). The job spools quickly, and is usually available within a minute or two. This is very cool. HP also has specific mobile apps for your devices, such as HP home&biz for iOS. But I haven't really needed them since the previously described services work so well. Bottom line, I'm thrilled to finally have true printing capabilities from my iOS devices. And the bonus of having easy-to-use web services also, allows me give HP ePrint a nimbleosity rating of 4 out of 5. Thanks for your thoughts on ePrint Derrick. I'm considering a new HP printer and I'm real happy to read these features work as advertised. Maybe some technology that is actually useful!